As you know I believe earthquakes are tied to the solar cycles and the plasma output of those compound cycles and the resulting plasmoids trapped in earth's magnetosphere. My concern is that we are reaching a point in the cycles that will mimic the time frame of the San Francisco earthquake of 1906. February 15, 2001 -- You can't tell by looking, but scientists say the Sun has just undergone an important change. Our star's magnetic field has flipped. The Sun's magnetic north pole, which was in the northern hemisphere just a few months ago, now points south. It's a topsy-turvy situation, but not an unexpected one. "This always happens around the time of solar maximum," says David Hathaway, a solar physicist at the Marshall Space Flight Center. "The magnetic poles exchange places at the peak of the sunspot cycle. 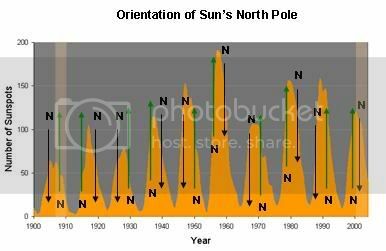 As you can see the sun's poles are reversed from 1906 and we can infer the sequence of the earthquakes will be in reverse also. The orientation of the sun’s poles determines the polarity of the bulk of the plasma thrown out. The plasma’s polarity determines which hemisphere of planet earth the plasma affects. This means the San Francisco quake looms in the near future if I am correct. It will then be followed by a large Taiwan quake and a large Columbia quake. It will be interesting to see if I am correct. What about the New Madrid fault? Tolenio: you ought to see if you can get this logged into the predictions page. If it doesn't pan out, no problem. If it does, something bears a second look. The big 3 New Madrid quakes were in 1811/1812 and there was a close approaching comet at the time. Connection? 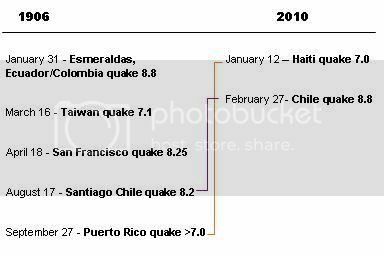 I believe the Madrid fault has reoccurent quakes of large magnitude every ~500 years. This places the next large quake in the year ~2312. This would be tied to the solar cycle of the same length compounding with others (longer/shorter) in solar minima. There will be quakes, but geologic history shows large quakes on a 500 year periodicty, which will mimic the above cycles in the sun. The only problem with putting the model in the collective "back pocket" of prediction is that there are are awful lot of people living on the US west coast who will have their lives impacted in the near future. Hello Tom: The EU community thinks comets, or pieces of comets, interacting with the Ionosphere, are a part of the equation concerning EQs. It might be something you can add to your calculations. Or not. I emailed a friend in Mill Valley CA. to stock extra water and food. And not sleep under heavy objects. INCOMING: This morning, the Solar and Heliospheric Observatory recorded a halo CME emerging from the vicinity of sunspot 1054: movie. The cloud appears to be heading toward Earth and it could spark geomagnetic storms when it arrives on or about March 17th. High-latitude sky watchers should be alert for auroras. Hello Tolenio: Do you have any thoughts on comets, or comet pieces being a factor in EQ behavior? Positive or negative thoughts. Only that plasmoids trapped within the magnetosphere grounding out at tectonic faults and creating geologic electromotive force would have a far greater influence than distant comets. It would be like standing and waiting for a bus in Boston, but keeping your eye on the New York Transit System bus schedule. Plasmoids trapped in the magnetosphere are the elephant in the room nobody wants to talk about. Hello again Tolenio: I guess i wasn't clear. The comet would be passing through the Ionosphere, not far away. And it would be exchanging charge differential with the Earth. Look at the number of sunspotsin the sun's northern hemisphere that travelled past earth in the past 9 days. Now look at the weather fronts of earth assuming the Indian Ocean is today and just beyond Hawaii is 9 days ago. Any similarity in the weather fronts in the northern hemisphere as to activity on the solar surface? That would be random, what I am seeing is a direct correlation between solar activity measurement and the timimg and location of earthquakes. Comets may be a wild card but I am seeing steady predicitable events based on geomagnetic events. This tells me there should be a quke some time today around Japan. Very predictable when you know what to look for. That same plasmoid that caused the Japan area quake will be reaching the US west coast on March 24th and we will see a larger than background quake event then.